Beech's Fine Chocolates have been making delicious chocolates since 1920. Their factory is located in the centre of Preston, Lancashire and they make chocolates under their own brand (Beech’s) as well as for a small number of 'own label' brands for quality retailers. Beech's boxed chocolates are perfect for gifting and even as a sweet treat for oneself. Their After Dinner Mint Creams and After Dinner Mint Crisps are one of my favourites. Recently, the lovely team at Beech’s sent us some of their milk chocolate goodies to try. First up was the Milk Chocolate Coffee Creams. These coffee creams are made using a traditional recipe with the natural flavour of freshly ground coffee beans in thick and delicious milk chocolate. These coffee creams also come in dark chocolate but I opted only to try the milk chocolate variety. As soon as I opened the box, a lovely coffee fragrance wafted out. This was what I was expecting. The chocolates were beautifully laid out in the box which itself had an understated but classic style. The milk chocolate perfectly complemented the coffee flavour. The coffee fondant had its own sweetness but the presence of roasted coffee flavour brought more depth and taste to these chocolates. A perfect combination of chocolate and coffee. I thoroughly enjoyed these and so did Mr.H. 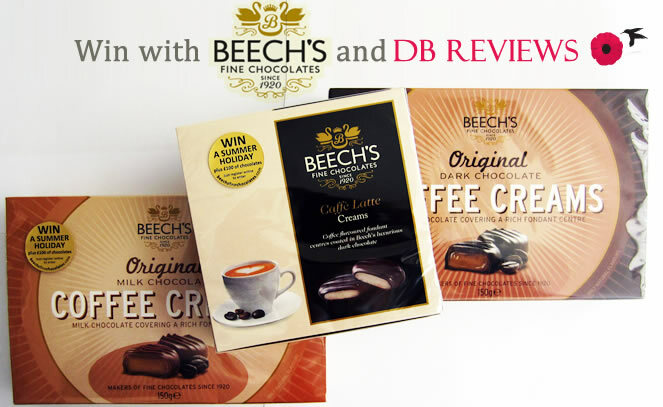 If you like Coffee Creams, then I would recommend that you try these ones from Beech’s. My favourites were the nutty ones with Dark Coffee and Walnut taking the top spot. Mr.H preferred the fruity variants. As with the Coffee Creams, the packaging of the 'Thank You' box was also simple yet classy. Priced at £3.49, this assorted box is perfect for gifting. Check out http://www.beechsfinechocolates.com/ for the entire range. And if you fancy winning some chocolate for yourself, then read on. 1. The competition is open only to residents of the UK. 2. No cash alternative offered. 3. Winner will be drawn at random from all the valid entries and must respond within 7 days of email being sent to them, failing which a new winner will be selected. 4. Prize will be dispatched directly by Beech's. I love dark chocolate the most, although any chocolate is good in my book! Milk Chocolate, but I will eat anything with "choc" in it lol. It'd have to be milk chocolate for me, but I love flavoured milk chocolate, especially with little bits of fruit in. Depends who or what the chocolate is, but generally milk chocolate! I love dark, so tasty. Milk chocolate, but dark if it's mint-flavoured! I love both, but Milk chocolate wins in a race lol!! I love any chocolate, I have taken quite a liking to coffee creams recently though. Dark chocolate - the darker the better! Dark chocolate is my favourite. I like both, but Milk chocolate is my favourite! I love both, though it depends which company is making it! Overall I think I'd probably go for dark chocolate these days :) I adore coffee creams, my favourite boxed chocolate! Has to be the milk. Dark chocolate - it has health benefits. Dark chocolate, which is a bonus because no one else in my family likes it so I can be sure that no one will eat it!